A law-themed musical produced by East China University of Political Science and Law will make its Guizhou debut on August 5. 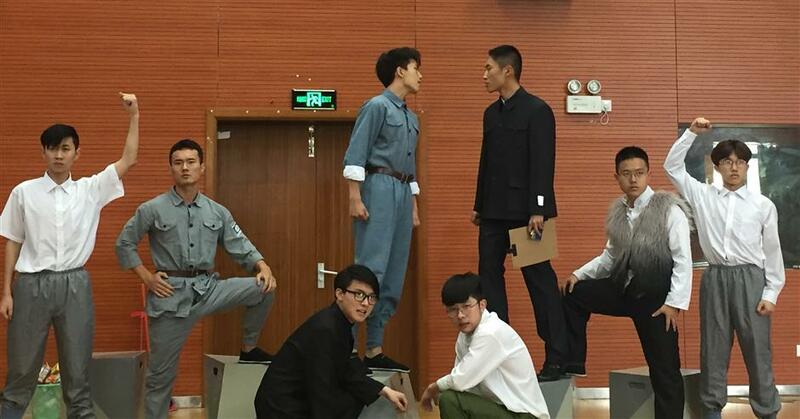 A law-themed musical produced by East China University of Political Science and Law will make its Guizhou debut on August 5. The show is part of a student performance for the ongoing 2017 Colourful Guizhou Culture & Art Festival, which started on July 29 and will last into late October. The musical “Law, Poem — Lei Jingtian” premiered in Shanghai in May 2016 and received widespread approbation. In the current version, a cast of 20 students are showcasing their musical and theater talents. It's the only all-non-professional-cast extravaganza Shanghai has brought to the culture and art festival in Guizhou. "Student plays are always an important part in Shanghai International Arts Festival,” says Yang Jing, deputy secretary of the festival. “This year we brought the musical to Guizhou, which is very meaningful and will be a wonderful opportunity for the students' artistic practice. Although the performers are not professional, their performance is as good as those played by a professional team." The story is about a female law student, Lu Mingjun, who suffers some setbacks on the cases she dealt with at the university's legal aid center, and unexpectedly travels back in time to the year 1937. She meets with Lei Jingtian (1904-59), a former president of the university, and the judge of China's first widely influential public trial related to Huang Kegong. Huang was a 26-year-old military officer charged with killing a female student after she rejected his marriage proposal. In the 1930s China still didn't have a very clear legal system, and military people had commanding role in society. So it's a challenge to value the penalty Huang has to receive, a soldier who joined the army as a 15-year-old and made a great contribution to the fight on Jinggang Mountains — known as the birthplace of the Chinese Red Army — and the Long March. Huang even wrote to the Red Army leader Mao Zedong for a pardon. However, despite pressures from various fields, Lei also wrote to Mao and tried his best to seek a fair verdict, which was later approved by Mao. Huang was eventually sentenced to death. Lei's ruling can be considered as a monumental moment in Chinese legal development because it set a precedent for the modern concept — "Ruling the Country by Law." After participating in the case and learning from Lei, Lu returns to the modern world and reconsiders what law means to her. This special journey brings her courage to overcome the obstacles on her way of seeking fairness and helping others. "In the play, Lu and Lei interact with each other. When Lu meets with Lei, he also struggles between sentiment and law because Huang was his comrade-in-arms in the Long March. As one living in the modern society, Lu tells him about modern legal ideas like 'everyone is equal under the law,' which helps him finish the ruling," says Lin Ziyang, who plays the role of Lei Jingtian. He competed with over 200 students, from East China University of Political Science and Law, and other universities, to land the role. “Even though I play Lei Jingtian, I feel my own experiences are more like Lu Mingjun,” says Lin. He also felt at a loss before applying for this role. "I hope I can find my own answers toward study, career and my future through this play." Lin says he feels honored to be able to participate in the Guizhou culture and art festival. ”Guizhou is a revolutionary base in history, and our play is not only a celebration show for the 65th birthday of our university this year, but also a gift to the 90th anniversary of the People's Liberation Army and the upcoming 19th National Congress of the Communist Party of China." According to Chen Saijin, producer of the drama and adviser to the 49-member performance team, the idea of a legal musical came from his own musical background and the innovation of college play. "I often publish some music pieces and also has the experience of making a short musical play," Chen says. "Moreover, there are many great college dramas in Shanghai but rarely a musical play, let alone one featuring law." Xu Jing, head of Guizhou Provincial Department of Culture, says Shanghai has long been in cooperation with Guizhou, making great contributions to Guizhou, including that of cultural industry. ”As our nation's window to overseas, Shanghai can help us to promote Guizhou culture to the world. And meanwhile, the introduction of Shanghai culture is also a guidance for the development of our cultural industry," she says.